"Drop it" is one of the most important cues to teach your dog, for your convenience and for his own safety. Someday your dog will grab something that he shouldn't eat or play with, and you'll be glad you took the time to train this. Step 1 - Pick your training treat. To train this cue, you need to figure out what treat your dog adores above all others. You're basically going to be offering to trade whatever he's holding for the treat, so it has to be a treat that's really worth it. Cheese? Hot dogs? Liver? Don't hold back! Step 2 - Offer a trade. Play with your dog with a toy - don't use one of her favorites - and get her to take it from you. When she has the toy in her mouth, put one of the treats right in front of her mouth and nose. If you've picked the right treat, she will open her mouth to take the treat, and the toy will fall out. Do this a few times until you've both got the hang of it. Step 3 - Associate the cue. Now, offer the trade, and the instant the dog opens his mouth, say "drop it." Timing is important; you must say it precisely as his mouth starts to open. Step 4 - Repeat, repeat, repeat. 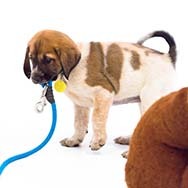 Give your dog many chances over the course of several days to trade the toy for the treat while you say the cue. With repetition, your dog will learn to associate mouth-opening with "Drop it. Step 5 - Test the cue. When you feel confident, try the cue without the treat in front of your dog's nose. If you've trained enough, your dog should drop the toy. Now give the treat - this time, after the toy has dropped. Step 6 - Stop paying every time. Once your dog reliably follows the cue, don't give the treat afterwards every time. Do it every other time, then on a random schedule, then when you don't have a treat in your hand and have to take it off the counter. This will teach your dog to follow the cue, even when you don't have a treat in your hand right this minute. Step 7 - Up the ante. Try the cue when the dog is holding more and more desirable objects. You may need to go back to the start for a while to get him to drop a bone or his favorite toy.